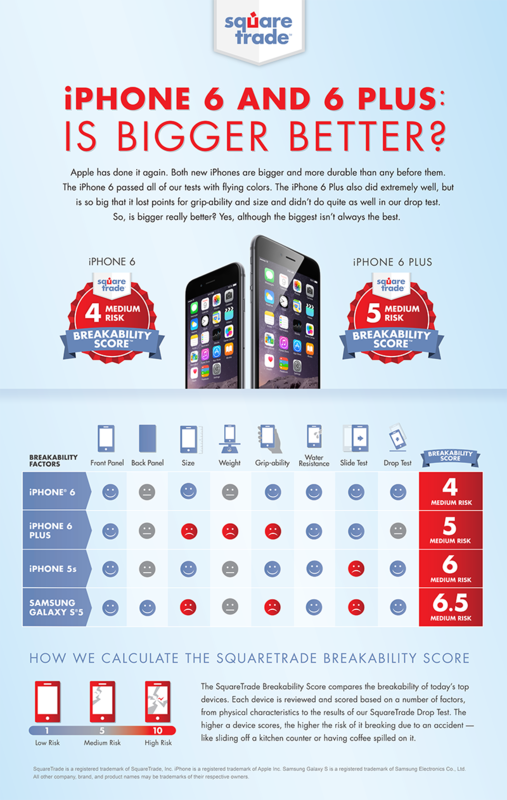 SquareTrade®, the top-rated protection plan trusted by millions of happy customers, today announced the iPhone 6 and its larger sibling, iPhone 6 Plus, performed impressively in Breakability testing, and each carries the top Breakability Score™ in their respective category. The SquareTrade Breakability Score ranks today’s top devices based on how prone they are to break due to accidents. Evaluating key elements such as front and back panel design, edge construction and materials, size, weight, friction quotient, water resistance and grip-ability, SquareTrade’s Breakability Score fills in the missing gap left by traditional device reviews: it tests devices in everyday danger situations brought on by our lifestyles and habits. The new series of iPhones performed above expectations, scoring higher than both previous iPhone models and popular Android phones like the Samsung Galaxy S5. The iPhone 6’s Breakability Score of 4 sets a new high mark with a slightly better performance than even Google/Motorola’s Moto X and the HTC One. The much larger iPhone 6 Plus scored a 5, more than a full point better than the Samsung Galaxy S5, making it the most durable phone with a screen larger than five inches. “Apple has done it again, with a pair of larger phones that are more durable than their smaller predecessors,” says Ty Shay, CMO of SquareTrade. “But as we saw with the ill-fated mishap of the first iPhone 6 buyer in Australia, accidents are still going to happen. Americans have spent over $10 Billion on iPhone repair and replacement since their release, and we expect that unfortunate trend to continue.” For more information about SquareTrade, go to www.squaretrade.com.